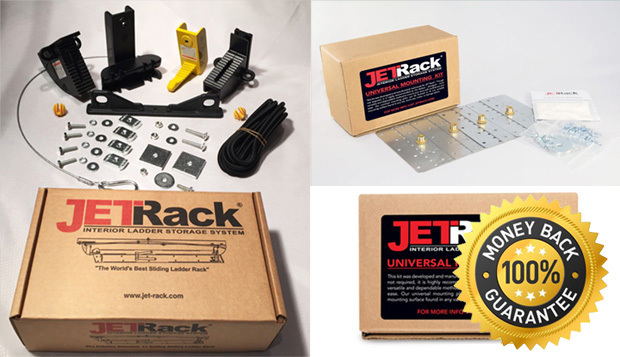 THE “GO TO” solution for mounting the hanger strut (sold separately) used for the JET Rack® system. FORMABLE – and easily trimmed to fit your unique application. INTUITIVE Design and simple, 1-page instruction. NO MORE GUESSING if the fastener you’re working with will hold – it will! GUARANTEED – Return product for replacement or full refund if it fails. 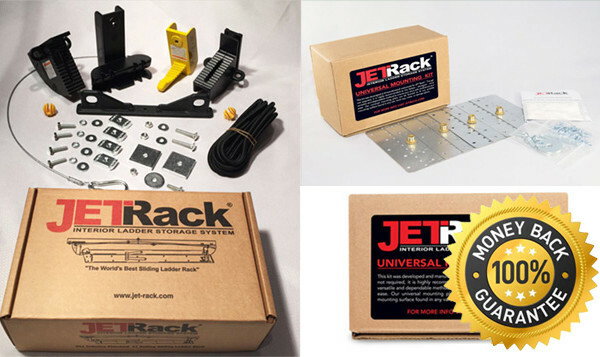 JET Rack and Mounting Kit Combined used for the JET Rack® system. Though designed and manufactured exclusively for JET Rack, we’ve found the JRMP1420 plate useful in a wide variety of ways: Whether used for all types of vehicle mounting applications, by tradesmen, or anywhere around the home where the strength of a 1/4-20 screw is preferable over the flimsy alternative. DISCLAIMER: No Warranties or Guarantees are made or implied for the JRMP1420 when used in applications other than for hanging strut used for a JET Rack installation. User assumes all liability and responsibility for ensuring a proper and safe installation.